Lithography is an exciting medium, and offers an incredible range of marks and visual expression for the artist. If you are interested in learning more about lithography, contact the studio to determine what type of workshop you would like to schedule. Workshops are scheduled on demand. In this day and age of increasingly busy calendars, we prefer to match schedules with you. Below are sample workshops and pricing estimates. Please contact us with any questions. Since 2010, Master printer and artist Carolyn Muskat has traveled to Hanoi, Vietnam, to work with artists, teach printmaking, and establish a cross-cultural partnership. These trips have been sponsored by the Indochina Arts Partnership (IAP), and have help build a lithography studio at the Center for Excellence in Graphic Arts at the Contemporary Art Center in Hanoi. Working with many of the leading artists and educators in Vietnam, Ms. Muskat shared contemporary printmaking methods and taught both stone and plate lithography. 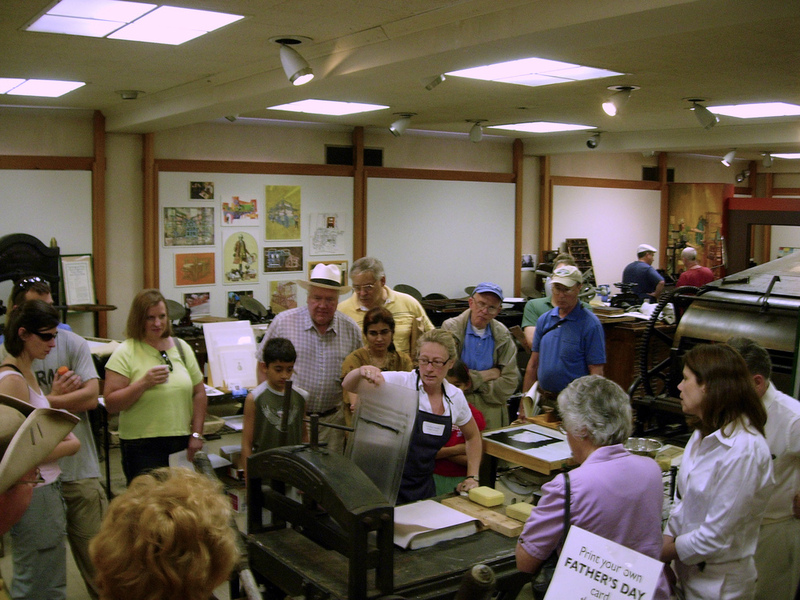 2016 Update: Iron Printmakers 4 is scheduled for Saturday, Feb. 27, at the Mass. College of Art & Design’s print studio! Once again, four area schools are competing for the coveted trophy! Boston University, MassArt, School of the Museum of Fine Arts, and Lesley University will be sending their teams in for a day of feverish creativity and printmaking! Judges this year will be Phyllis McGibbon, John Pyper, and Deb Chaney. The public is welcome to observe, so please join us if you are in the area! Iron Printmakers 3 took place this past spring in Mass College of Art & Design’s fabulous print studio. Sponsored by Muskat Studios, the college-level printmaking competition is loosely based on the Iron Chef TV show. It challenges four teams to create and print editions of ten incorporating lithography, relief, intaglio, and screenprint within a limited time (5 hours!). This is complicated by “mystery ingredients” that must be incorporated into the finished prints somehow. This year was as exciting as usual – with the teams making the judges decisions super difficult. The School of the Museum of Fine Arts pulled a “repeat” win – taking first place! Special thanks to the following for their support and sponsorship: MassArt, Takach Press Corp., the Boston Printmakers, my husband Seth, my wonderful volunteers, our judges (Debra Olin, Jenny Hughes, and Brian Shure) and the students and faculty that participated!!! Stay tuned for next year’s competition!! 2015, The School of the Museum of Fine Arts, Boston. 2014, The School of the Museum of Fine Arts, Boston. 2013, The Art Institute of Boston, Lesley University. Each year, Carolyn and her husband Seth packed up everything but the press and traveled to the Museum of Printing in N. Andover for their Annual Printing Arts Fair. Carolyn spent the day printing new images in the ongoing tool series: this year, there was an image of Plumb Bobs as well as an image of a beautiful Plane -- thanks to assistant Emma O’Leary’s dad’s amazing collection of antique planes! The weather was warm and humid, but the printing and the crowds were great! Muskat Studios sponsored a day of fun for the terrific assistants who work at the studio keeping everything running along. The weather was perfect – warm and sunny! We spent the day at Kimball Farms enjoying a (very) competitive game of mini-golf, too much fried food at lunch, super killer bumper boats and an insane amount of ice cream! Thanks to all of my gang!!! Practice your game for next year!